Crowds in Riga filled the square in front of the Presidential Castle to severely criticise the Latvian political environment uncovered by the leaked «Oligarch talks». 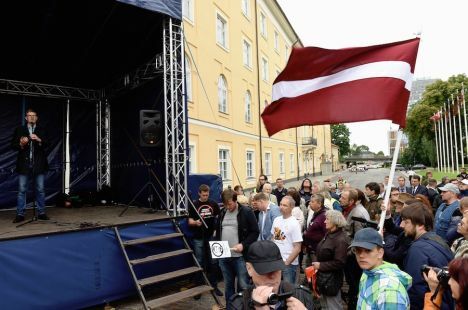 The protest entitled the People’s Meeting in the Latvian capital was organised on Thursday, July 13, by the New Conservative Party, which comprises former senior officials of the Latvian Corruption Prevention and Combating Bureau. «1. To the President, to demand the resignation of the ministers involved in the «Oligarch talks» – [Minister of Transport] Uldis Augulis and Minister of Agriculture [Jānis Dūklavs]. 2. To the National Security Commission and the Minister of Justice, to provide assessment of the situation from the view of principles of democracy. 3. To demand an explanation from the Prosecutor General on legal incompetence in protecting national interests. If not received, to demand the resignation of Prosecutor General Ēriks Kalnmeijers. Latvian President Raimonds Vējonis also arrived at the protest and listened to a number of speakers severely criticising him for inaction at a time when, according to a speaker, priest Juris Cālītis, «a network of state traitors has been uncovered». Vējonis was asked to take the stage and said: «You stand for a strong country with the rule of law and I stand for a strong country with the rule of law. We are also for a transparent society, free, independent media and, of course, the basis of a strong country is the rule of law». After the speech, Vējonis received mixed reactions and the crowd chanted: «Show some backbone!». BNN reported that Latvian President Raimonds Vējonis has stated previously that every person, especially officials, involved in the so-called «Oligarch talks» should evaluate their role in the leaked conversations and explain their actions to the society, taking responsibility for it. Vējonis on Wednesday, June 12, evaluated the «Oligarch talks» as unacceptable and such that could not be supported: «The talks and the participation of politicians weaken our country. Strong society and transparency in decision-making, as well as independent media are the basis of a strong country, and everyone without exceptions has to work for the good of the country and the society, with respect to the country and its population». This week the National Security Council of Latvia decided that the evaluation of the content of «Oligarch talks» and related events should continue. The Latvian president also expressed his support to the establishment of a parliamentary enquiry commission and urged MPs to hesitate with its establishment. Reportedly, transparency NGO Delna has urged Latvian President Raimonds Vējonis and Prime Minister Māris Kučinskis to take responsibility for the progress of the scandal involving their political associates. In a letter to Kučinskis, sent on Monday, July 10, Delna has reminded of senior Latvian officials mentioned in the leaked Rīdzene hotel conversations – Minister of Agriculture Jānis Dūklavs and Minister of Transport Uldis Augulis – and their meeting with Deputy Prime Minister of Russia, Arkady Dvorkovich, in August, 2016. «The [Latvian] Foreign Ministry was not notified beforehand on the meeting and the Prime Minister failed to provide information to Delna, why was the meeting held in secrecy, what were the issues discussed and what agreements were reached,» Delna noted. The organization has also urged Māris Kučinskis to demand the resignation of Dūklavs and Augulis. Delna, which is the Latvian branch of the anti-corruption organisation Transparency International, standing for openness, rule of law and democracy, has called on President Vējonis to ask during the sitting of the National Security Council for constructive actions from heads of investigative bodies Prosecutor General’s Office and the Corruption Prevention and Combating Bureau. Latvia has been run by liars, thieves and crooks since independence, and that includes the current lot of politicians, including Vejonis. They have been protected by a corrupt anti-corruption commission KNAB, and a useless Prosecutor General Kalnmeijers, who wont do anything about disclosures in the oligarch tapes. It is no coincidence that there is a doctors strike currently on, and in recent times, there have been protests in the streets by teachers, pensioners and others. Corrupt countries dig their own economic grave, and that is happening in Latvia right now. Until the current lot of corrupt politicians are kicked out, until the anti-corruption commission is cleaned up, and until the Prosecutor General is sacked, Latvia will stay a poor third world country.